One day, Call of Duty won’t reign supreme every year. 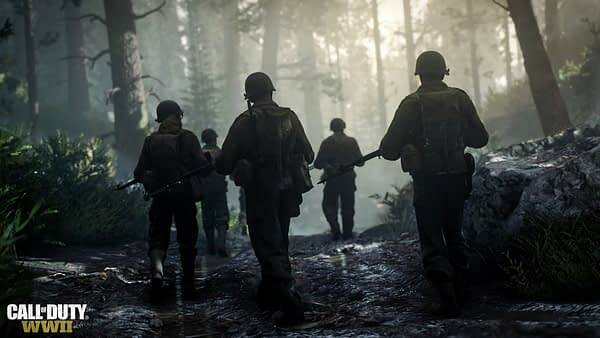 While interest has certainly waned a little bit over the last few years, WWII seems to have been a renewed shot in the arm as the series went back to its historic roots. To emphasise the franchise’s still-relevant dominance, the game has sat atop of the UK sales charts for a whole month now. In its time, it’s seen off challenges from Star Wars: Battlefront II as well as Black Friday sales, but alas, it remains unmoved. The ever-popular FIFA 18 is second, but it seems Gran Turismo Sport really benefited from a run of Black Friday deals, seeing the game jump from 12th to 3rd in a week. Others seemed to have gotten the Black Friday touch, too, with Forza Motorsport 7 jumping from 15th to 6th while Wolfenstein II: The New Colossus went from 18th to 7th. Now, as always, it’s worth noting that these sales only account for physical, which is getting a smaller and smaller market share — so this offer only a part of the picture. At the same time, it certainly gives us a glimpse at what the market is doing and it seems, Call of Duty is going to be here to rule the industry for a while longer.